JOEY Pouch Sorter is an ultra-flexible system that makes use of powered systems and gravity to transport, sort, accumulate, and buffer items in the DC. This unique solution uses pouches to handle an infinite variety of individual items. The solution generally incorporates loading stations, intermediate storage buffer, and a feed to packing stations. The pouches can be delivered to a packer at an order level or in an exact sequence. 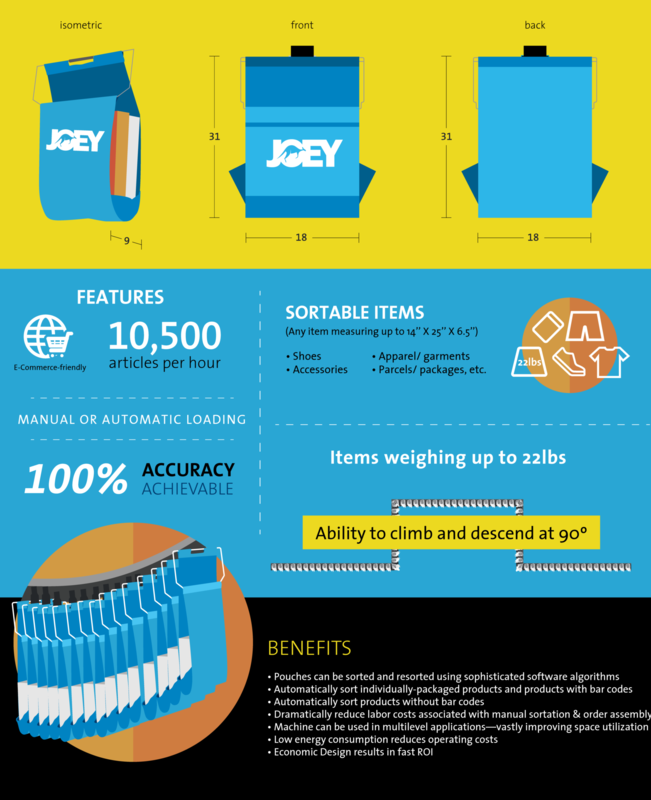 JOEY Pouch Sorter is the ultimate goods-to-man solution because the operator only needs to remove the items from the pouches and pack them, which could alternatively be integrated with automatic packing machines. The versatility of the design allows for the system to be designed above or around existing processing areas. This maximizes the existing footprint, instead of expanding or moving to a new facility, offering an opportunity for dramatic cost savings.